Hey folks, for today's post, I thought I'd change tack a little and put up some pics of my Kingdom of Britannia fleet for Dystopian Wars. Dystopian Wars is a relatively new game on the market, from UK developer, Spartan Games. It's set in the late 1800s but in a slightly altered reality. A technological discovery in Antarctica lead to the major world nations developing huge war machines, rather than use the tech for the greater good. 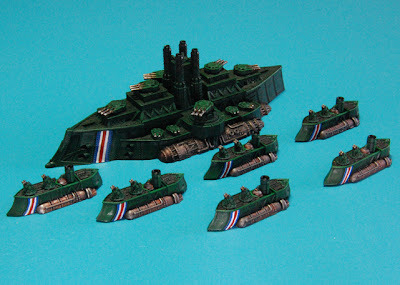 Dystopian Wars got popular in a hurry, possibly unexpectedly so, and models and books were at somewhat of a premium a little while back. Unusually for me, rather than read the rules first and get an idea of where I'd go with it, I figured I'd be patriotic and throw my lot in with the Kingdom of Britannia. The Prussians and Blazing Sun were already popular and I didn't like the American boats too much, so the KOB seemed like the best bet. I picked up the starter fleet and set about painting them up. After a couple of games against John's Blazing Sun faction, I quickly added another battleship and hoped that running two battleships would psych out the opposition. However, the Dreadnought class ships were released shortly after, and my battleship team (above, with three cruisers) was quickly outclassed. The other real issue was that the KOB ships need to be fairly precisely placed in order to capitalise on the weaponry on board and how it is positioned. Being under-gunned on a small table with lots of land features is a certain loss for the Brits.... if you play an 'out of the box' army, that is. 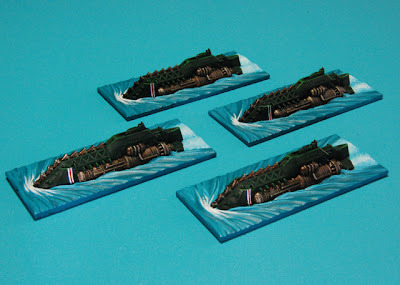 The answer came with another wave of reinforcements for the KOB in the submarines. These things come with a 'ram rating' so if there is a collision, then they're at a considerable advantage. I'm not a finesse guy at all; my gaming motto has always been 'roll the dice, don't think twice' and just throw it all in there. I was causing collisions with my other boats and fairing reasonably, but by taking models with a ram rating, it gives you the upper hand in these situations. Add to that, these things can surface, ram an opponent, then submerge again out of harms way, so a much better fit for my playing style. Despite my initial determination not to run a dreadnought like everyone else, they're just too good and I took the plunge. They pack a massive punch anyways, but the ram rating sold it. So much so, that I bought a second, which is still awaiting paint. The smaller vessels in the pic are the Bastion Class Escorts which you can throw in front of the capital ships and take a hit. Unlike most of the other escorts available, the KOB boats don't have a primary weapon in addition to the anti-air defence systems, which is a minor grumble. To add a further threat, I added to the number of bombers in the fleet. I've also customed the 'tiny flyer' tokens for another talking point. 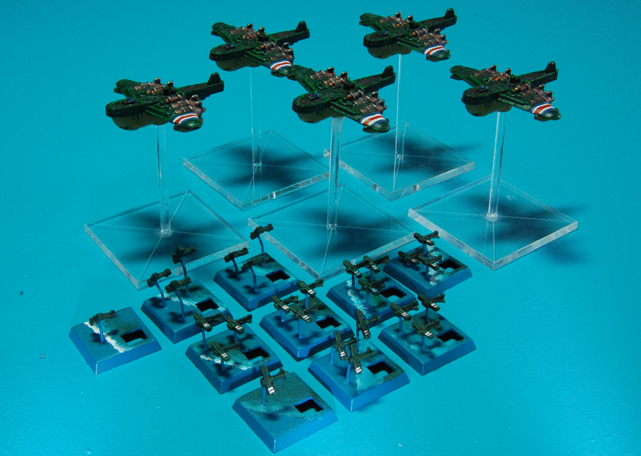 The standard tokens are single-piece resin castings, 20mm x 20mm with three planes molded on the top. My good mate Dan pointed out a couple of web pages where others had 'released' the planes from the bases and thought I'd give it a try. It's easy enough to do with a small multi-tool with a circular blade (remember to wear a mask!). The planes can then be re-mounted onto a Warhammer-Fantasy-sized base, using thin brass wire located in a small hole drilled on the underside of each aircraft. The square holes in the corners were cut to act as dice-docks, another idea from the interweb. Each is big enough to locate a 5mm dice in, so you can track each tokens fuel consumption without losing your dice in amongst all the other markers on the tabletop. The current, revised list comprises of two dreadnoughts, each with escorts and a tiny flyer combat air patrol, the submarines and the bombers. And that's about it. 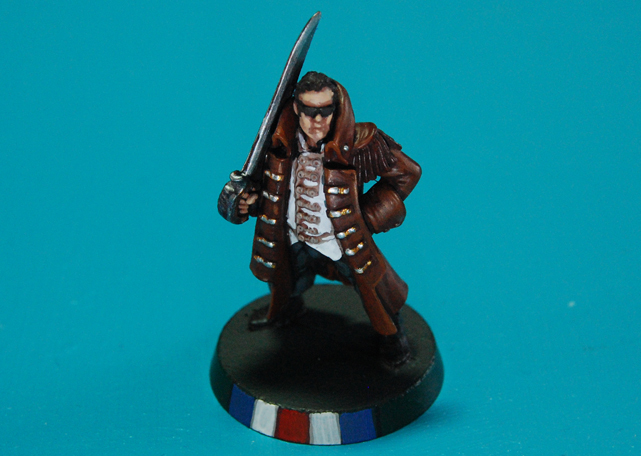 As I'm running two dreads, I figured I needed a marker to denote which one is the flagship and I found this guy on the Hasslefree Miniatures Website. 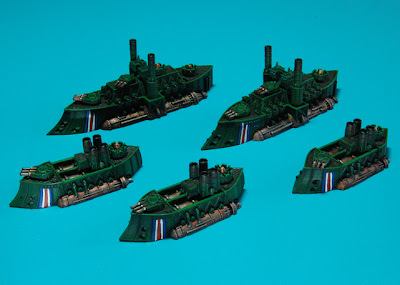 He does the job pretty nicely, and I've tied the figure in with the fleet by carrying the dark green livery through onto the base, along with the red, white and blue striping seen on the side of each ship. Loving the fleet mate, really good work keep it up.